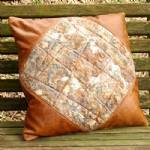 The front of this one-of-a-kind pillow features a diamond of my handmade felt. The felt is made of brown corriedale and white merino wool with accents of coral, green, and blue acrylic fibers and white silk fibers. The entire back and the front corners of the pillow are a soft garment leather in a distressed brown finish.